The City of Chicago Department of Housing and Economic Development, a bureau of the Chicago Department of Planning and Development (DPD), promotes economic development by helping existing businesses grow and by attracting new industry to the city. 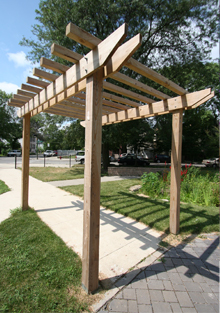 The landscape designs for this project were reviewed by Chicago Public Schools, and DPD intends to transfer ownership to Chicago Public Schools in the future. See sample learning landscape projects: Libby Elementary, Harper High School and Richards Career Academy. Learn more about Chicago Public Schools.